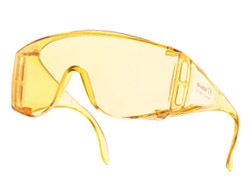 Bolle is a French family owned business and one of the only manufactueres of safety glasses to continue to research and develop in the field of safety eyewear. All their glasses are optical quality 1 and exceed all the industry safety standards. 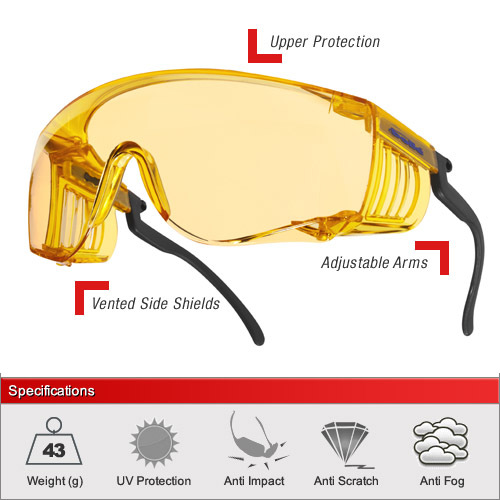 This pair of cover specs, which is as highly rated in terms of safety standards as all the more expensive safety glasses, have anti-fog and anti-scratch lenses. More so they have integrated side shields including upper and lower protection. Both the frames and lens are F & T rated, capable of withstanding impacts at 45m/s even at extreme temperatures. They are regarded as the best visitor spec on the market, ideal for VIP's and other customers you wish to impress. Of course they are also excellent as a general all round pair of safety glasses with full UV protection. Adjustable arms in conjunction with a unique design allow them to fit to every face comfortably. Each pair also comes with a neck cord as standard. For a full explanation of European standards in safety eyewear including how to interpret the frame and lens markings then please see our dedicated Standards Advice Section. We have 1 lens available in this frame. The clear lens for 100% optical quality 1 performance. For a full explanation of the different lens types and their ideal usage please see our dedicated Lens Advice Section. For additional information please click the image or 'Full Specifications' link above.